There isn’t a ton of excitement within this group, as they lost Salvador Perez for the season, on top of already being a rebuilding club. Adalberto Mondesi is the exciting player of this group, who brings a ton of speed. The Royals are built for speed, as Mondesi, Billy Hamilton, and Whit Merrifield are all terrific stolen base threats. Merrfield is the more consistent contact bat, however. The Royals are going to struggle for power. Jorge Soler and Ryan O’Hearn are power bats, but the contact rates limit them tremendously. Having Alex Gordon as a three hitter says a lot about the club. It is going to be a while before the Royals get out of the basement on the offensive side. They also don’t have a ton of platoon bats to give them changes against lefties either. 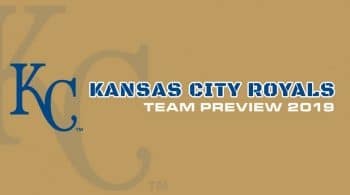 The Royals rotation is in rough shape heading into the season, and that is the case for a few teams in the AL Central. They finished with the second highest team ERA in 2018, and they should likely be in the bottom ten again. Danny Duffy headlines this rotation, and has struggled with home runs the last few seasons as a fly ball pitcher. Duffy has also shown some decline in his velocity, and it might be injury related given he has spent some time on the DL the last two seasons with arm issues. Duffy is projected around 150 innings this season, and a near five ERA. Not the type of production you want from a lead arm. Duffy is going to have some positive outings every now and then when he has his off-speed stuff working, and that will go for Jake Junis too. Junis is a high slider usage arm, and when that slider is on, he has above average strikeout stuff. The issue is that his slider didn’t quite have it most games, and that is where teams teed off on him. Junis is projected for a similar season to last, and unless he added something in the offseason or had an increase in velocity, that will likely be true. Kansas City doesn’t have any long term options in the rotation right now, so names like Brad Keller, Ian Kennedy, Heath Fillmyer, and Eric Skoglund are going to continue plug in starts. Kennedy is the more recognizable name, and has been around in the majors for a while. Kennedy is consistently average, and the fly balls for him make him prone to blowups. There are not a lot of names here that project well this season, and nobody is projected for a WHIP under 1.20. Keller has the best chance to breakout in the ERA department, mainly because he is the only name to rely on ground balls and pedestrian hard-contact rates. He is projected to slide into the second spot in the rotation. Skoglund has an issue like Duffy with allowing a lot of fly balls, which leads to production from hitters. During the colder months this rotation might be able to get away with it, but once things heat up, the arms usually cool off if they haven’t already.